Throughout the month of April, BWT’s third generation of television advertising will go live and will aim to support the activity of its stockists and installers. BWT are said to be keen to make it easier for its installers to introduce the topic of Luxury Water and its benefits to householders through increasing awareness of water softeners and the BWT Brand. The new advertisement highlights three areas of modern living: enjoyment and the benefits that softened water can bring to bathing, showering and even the laundry; the protection of expensive domestic appliances like dishwashers and washing machines; and finally the money that can be saved through the use of less detergents, soaps shampoos and specialist cleaners. Supporting this television advertisement will be a 3-month long digital campaign, starting from the beginning of April and running until the end of June. 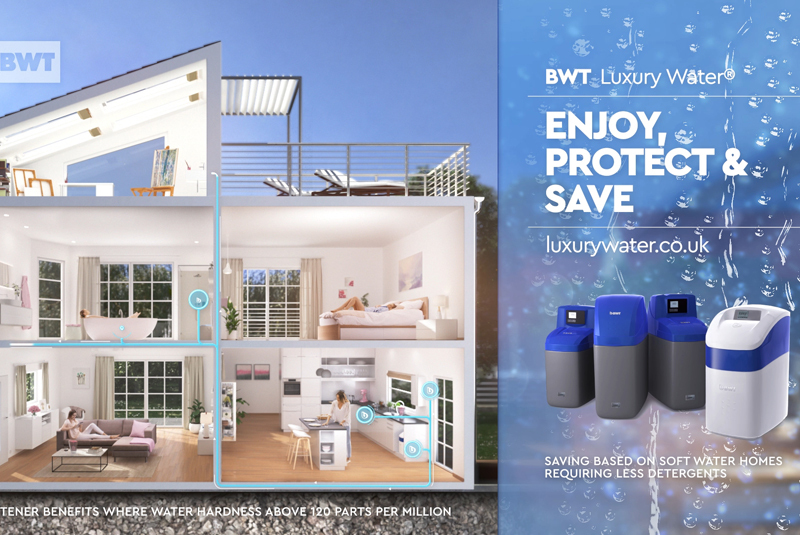 With both the television advertisement and digital campaign, BWT hope to ensure that the benefits of Luxury water and water softeners are hard to miss. BWT UK Limited is part of the Best Water Technology (BWT) Group, Europe’s Water Technology Company. With over 25 years of experience, it delivers water treatment technology to the UK and continues to supply safe, high quality water to domestic, business and commercial communities. BWT also provides water treatment technologies and services for homes and businesses across Europe. Its Research & Development teams use the latest research to create products that are both ecological and economical. A key development issue of the company is said to be the reduction in the products’ consumption of operating resources and energy, to maximise efficiency and minimise CO2 emissions.